A tire pressure gauge is a tool that all car drivers should own. They are small, affordable, and easy to use and can have a big positive impact on your vehicle since they can help you inflate your car tires correctly. Generally, tires that are inflated to the correct pressure will be more responsive on the road, making your car easier to handle and safer to drive. Correctly inflated tires can also increase the fuel efficiency of the vehicle, saving you money over the long run. With so many pressure gauges available nowadays, we would like to help you find the right one. Hence, in this review, we are going to look at one of most popular, and one of the simplest designs of digital tire pressure gauge on the market today. This tool is made by Accutire and has a very basic design. Some manufacturers that create simple pressure gauge tools are keen to use that simplicity as an excuse to add extra tools and functionalities. Accutire has resisted that temptation and instead have produced a simple, yet very effective and extremely tough tool that boasts a construction that utilizes high-quality materials like metal and rubber. The Accutire MS-4021B Digital Tire Pressure Gauge is going to be particularly appealing to people who want just a pressure gauge. That may sound like a very obvious statement, but as we mentioned above, many of these types of tools carry a range of additional built-in tools. Additionally, since it is made of high-quality materials, it could appeal to people who know that they put their tools through a tough life. When you purchase this product, it comes packed into a single box. Inside, you will find instructions for use and the device itself. As it is a digital model, you would expect that it does require a battery to operate. Fortunately, three 1.5V button battery cells are pre-installed, making the product ready to use straight out of the box. The stand out features on this product are its simplicity and its toughness. To look at the first point, the Accutire MS-4021B Digital Tire Pressure Gauge is so easy to use. In fact, it doesn’t even have any buttons for you to worry about or memorize. You simply attach it to the tire valve, and it would take a car pressure reading, which is then displayed on the easy-to-read screen. That’s it! The job is already done! On to the second stand out feature, which is the product’s innate toughness. If you are looking around the market for similar styles of a tool, you will find that a large number have a plastic construction. As anyone will tell you, tools that are made of plastic materials will not last long even if you care for it. That said, the manufacturer made sure that the main body which houses the tool workings has a protective metal casing, while the handle is built of tough rubber. With this combination of materials, you have a tool that can easily stand up to the rough and tumble of everyday use and storage. Measuring across a range of five to 150 PSI with an accuracy of 0.05PSI, we can say that the device has a high level of accuracy. It is also equipped with auto shut-off to prevent accidental tire deflation. That’s about it really as far as features go. One of the joys of these types of devices is how simple they are to use. You don’t have to practice; they are intuitive and simple enough for just about anyone to use. So, to use it, you simply insert the nozzle mounted onto the top of the gauge into your tire valve. Then, press down for a secure seal, wait a couple of seconds, and the device will supply a PSI reading. As we have tried to express in this review, one of the great positives of this device is simplicity. However, if you are looking for a more comprehensively equipped tool, then you could take a look at the AUTMOR Digital Tire Pressure Gauge. Apart from being a high-quality digital pressure gauge, it is also equipped to measure tire tread depth and has a very useful, built-in emergency glass hammer. 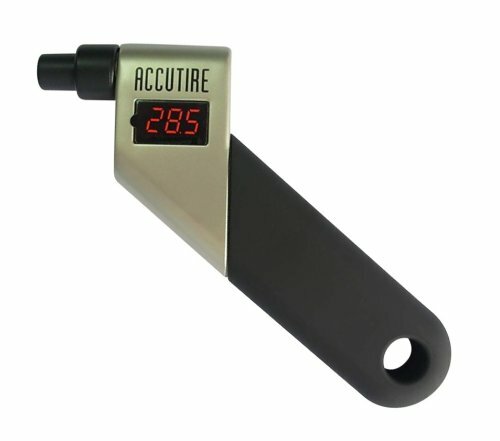 The Accutire MS-4021B Digital Tire Pressure Gauge is a prime example of a tool with a simple but highly effective design. There are no superfluous tools or features on this model; it is just a very easy-to-use and accurate pressure gauge. Add to this its extra tough construction and very reasonable price tag and you are looking at an excellent digital gauge. If you want an extremely tough, very simple pressure gauge, then it’s hard to find a better product on the market than the Accutire MS-4021B Digital Tire Pressure Gauge.